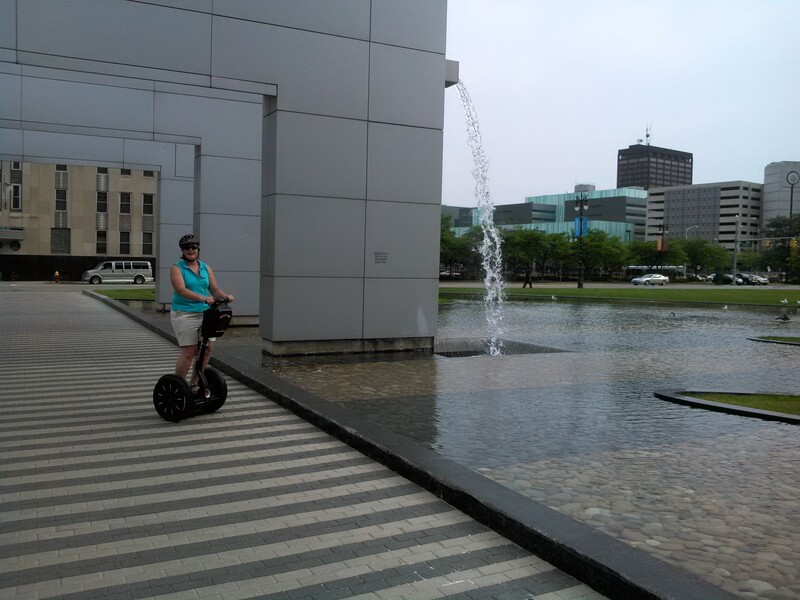 Over a year ago the idea of doing a Segway tour of Downtown Detroit for the conference was brought to my attention. Maureen Kearn’s new company, Segways2U (http://www.segways2u.com/), was featured in a local newspaper (not sure if it was the News or Free Press). It definitely started to draw interest with the Local Site Committee (LSC). 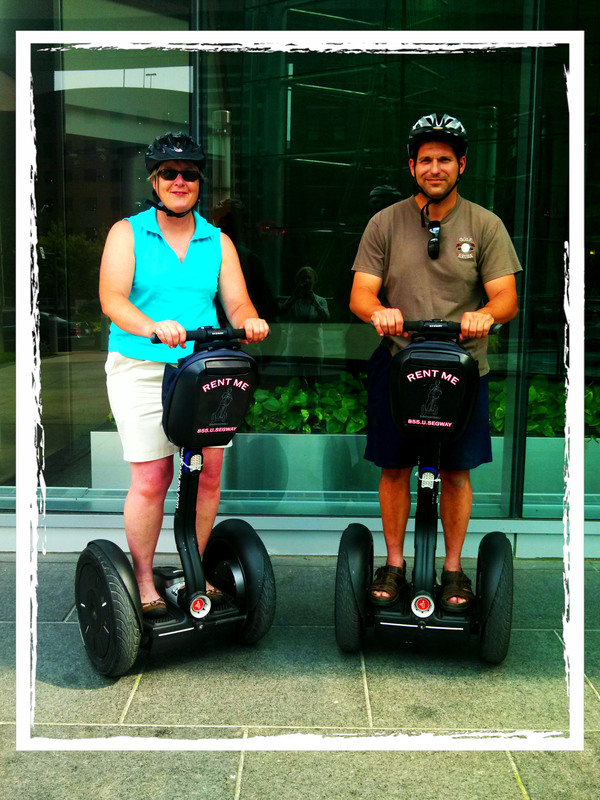 None of us ever had experience with Segways, but thought it would be a quick way around Downtown to see all of the sites that we had in mind. Walking would not be a possibility with the limited time that we had. We definitely wanted to show landscape designers from around the country everything Detroit had to offer: the good, the bad, and the unique. On Friday, June 21, myself (Steven D. Thoms) and Mildred Hurley, LSC Tour Captain went on a pre-tour. We met each other at the GM Renassiance Center to our amazement downtown was crazy with people. I hadn’t heard about it before arriving but River Days was happening along the RiverWalk. This was both exciting and scary. Exciting to see people downtown but also leary about operating a Segway with so much pedestrian traffic. We were both hesitant getting on these peculiar looking pieces of equipment. The safety video that Maureen showed us displayed people riding on these as easy if they were walking down the sidewalk but it also was scary with the possible incidents that could happen. Maureen was very helpful in describing everything and taking us outside the RenCen to get us acquainted with her machinery. It was to our amazement that we both caught on very quickly and off we went into the city. We left the RenCen and headed into the mobs of people enjoying the festivities along the Detroit River. We avoided going directly on the RiverWalk and used the bike path on the street that runs parallel with the river. We quickly made our way onto the Dequindre Cut enjoying the smoothness of the new asphalt. This path was much less populated than along the river which gave me a chance to open up the Segway and top it out at the 12mph max. We enjoyed watching the landscape maintenance crew work on the grounds and the planned graffiti at various points while traveling along this part of the tour. We quickly made it to Gratiot trying to maneuver our way to the Eastern Market area. We later found out from Maureen that there was an easier path to travel. As we came to the end of a overpass over the old rail road tracks, Mildred forgot how to stop and continued to move past the street that led us to the urban garden of Greening of Detroit. Mil got control again and caught up with me so we could view the gated gardens. Although it is still early in the growing season, we can only imagine what the gardens will look like in early August for the conference. We then made our way over to Eastern Market which was quiet on this Friday afternoon. We started our track back to downtown trying to take in the sights. 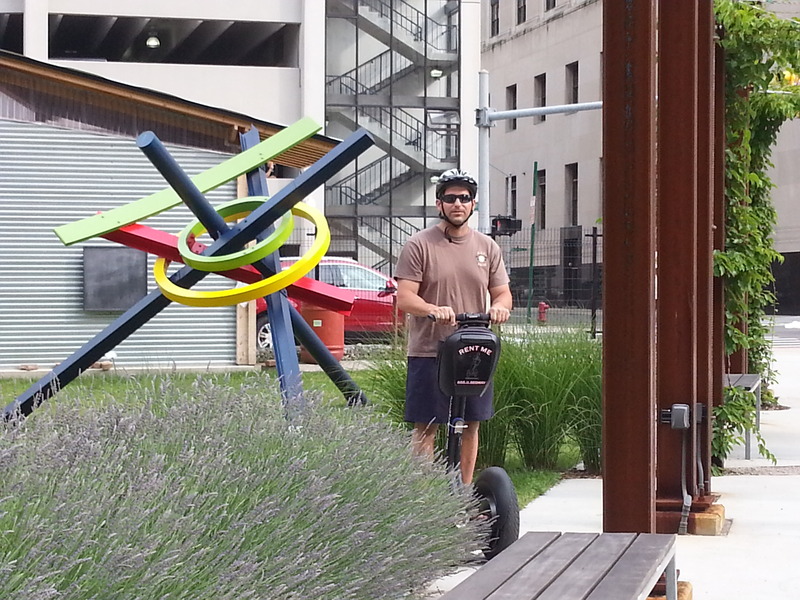 I’ve driven and walked downtown, but the Segways just gave me a whole new perspective of this “Great American City”. We were surprised how quickly we had made it to this point of the trip, so we decided to go off course a little. Once we made it to Woodward, we headed North towards a different crowd, baseball fans. The stadium district was hopping with Tiger fans and the hard-to-believe Boston Red Sox fans. Yes, you read that right. Many (I mean I saw 100+) in our short journey. If you are from another city that might not sound funny, but unless it was a playoff game people don’t travel from other cities to come to Detroit. You might get the occasional driving fan from close cities such as Cleveland, Toronto or Pittsburgh but this was completely different. Mil and I than made our way past the filming site of the upcoming Transformers movie and onto our way to the headquarters of DTE Energy and the MGM Casino. We enjoyed the massive water feature that is on the DTE campus and took a quick peak at MGM’s vegetable garden. We then headed over to Lafayette Gardens. Mil and I were really noticing our feet were getting fatigued. Even though we weren’t walking, the way the Segways work is your feet/ankles do the accelerating/braking. Just as we were heading back to the front entrance at the GM Ren Cen we noticed there was a son and father completing their tour of the city. Mil started a conversation with them and it was obvious they were from Boston. They had stated that they were having so much fun on their visit to Motown. We hope you can join us for APLD’s annual International Design Conference August 2 – 5, 2013. Early bird registration closes in just a short time so cash in. If you have any questions, feel free to contact me.